It's been a while since I posted my last recipe. Life is going very busy with me adapting to a new surround. As I take my time settling things down here in a foreign country amidst an unknown culture, my posts might not be so frequent for a while. Anyhow, I will try my best to update my blog with a host of culinary creations, no matter how sporadically. Have patience! Last night only I prepared the dish detailed below. My kitchen is yet to be fully set. With a limited number of ingredients in hand as of now, I rely on my culinary instincts to create something new. This one turned out to be really tasty and goes well with fried rice or plate of plain chowmein. 1) Boil the mushrooms in microwave for 5 minutes. Drain the water. 2) Heat oil in a pan. Add garlic and shallow fry. 3) Add the chopped onion and brown. When onion changes color to golden brown, add the shrimps. 4) Stir around and shallow fry the shrimps. About this time, add the mushrooms. 5) Now pour the yogurt diluted with 1/2 cup of water into the mixture. Add salt and black pepper powder. Let it simmer on medium heat. 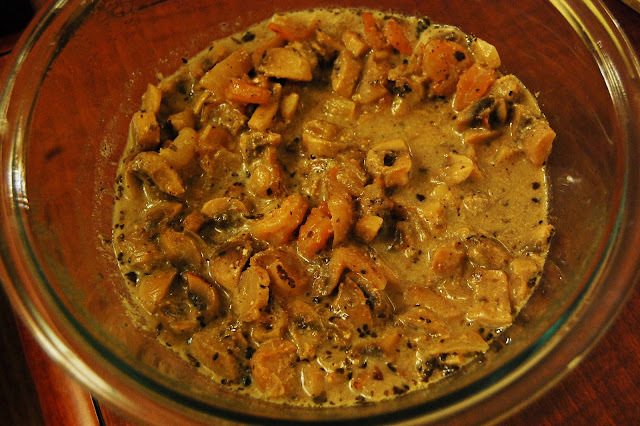 6) When mushrooms and prawns turn soft and the gravy thickens, squeeze the lemon juice. Stir in to blend well.